Located in south eastern Kentucky, Red Barn at Wilderness Ridge is nestled in among old oak trees, large maples and mountain Laurel. 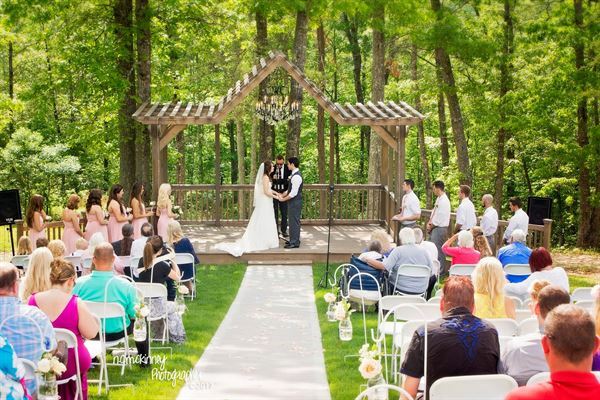 In addition to the barn itself, the property features other appealing sites for wedding ceremonies, both waterside and in open grassy areas, as well as endless scenic photo locations. Even though we have added the modern conveniences of running water, electricity and restrooms, A/C and heat we have kept the country charm of an old, rustic wonderful barn! The Red Barn is perfect for any event. The barn has a large kitchen, bar area, dance area, sound system. It also has three restrooms, a/c and heating. Plus, lots of outdoor space for yard activities, etc. An amazing place for parties big or small! The Red Barn is 3,500 square feet, and has a seating capacity of up to 200. Large doors open onto a manicured landscape that is perfect for a ceremony and additional reception seating. Our fully furnished bridal suite is the perfect space for the bride and her maids to have a private, yet spacious area to prepare for the big day and to be able to watch guests coming and going. The bridal suite has two dressing rooms and two bathrooms, a full kitchen and living space as well as a private balcony that overlooks the ridge at the back of the barn. Package includes the following: You have access to the barn for two days, the day before your event for set up, decorating and rehearsal and/or rehearsal dinner, from 10am until 7pm and then the day of your wedding from 10am until 11pm. -Tables and chairs for up to 200 people linens and chair covers are included. -Sound system and an area for dancing equipped with disco ball -Nice kitchen with large prep areas, industrial sized refrigeration and sinks plus a nice sized food warmer. (We do not allow full-scale cooking) -Private entrance for caterers and delivery services. (We do not require a certain caterer to be used at our venue so you are free to hire whomever you like.) -A really fun, separate bar area equipped with refrigeration, sink, ice maker, and storage for all your drink ware supplies. -3 restrooms -Full a/c and heating Surrounding area: The Barn area consists of manicured lawns and a small pond. Pergola outside that can be used for your ceremony. Covered porches equipped with tables, chairs, and ceiling fans Plenty of parking is available. To make your day even more complete you can rent our bridal suite for $300 An amazing space with panoramic views of the entire grounds. An ideal spot for you and your bridesmaids to relax and enjoy those few hours leading up to your ceremony. Beautiful venue! The owners are super nice and Heather the event cordinator was a pleasure to work with. They were very accommodating to my needs. Everyone enjoyed the wedding and couldn't stop talking about how beautiful this place is! Highly recommended this venue! This place was wonderful for our small event! The owners are amazing and great to work with. Picture oppertunities are amazing as well. Loved it!